Our focus today is on spinach, a plant filled with iron and multiple vitamins. Spinach often gets a bad rap, and people associate it with unpleasant childhood experiences. It must be that as we grow older and realize the nutritional benefits of this plant our tastes somehow mellow and many of us decide it is a food we can eat with pleasure regularly. I almost always have a bag of fresh spinach in my crisper. So what to do with spinach? My first thought is salad, of which there are numerous varieties. Then creamed spinach, spinach pizza, spinach quiche, spinach with pasta, spinach lasagna all begin to come to mind. A recipe for Baked Eggs with Spinach and Brioche caught my attention and that is what I finally settled on to make for this post. My husband and I thoroughly enjoyed this dish. I won't repeat what my children said, nor relate the battle that ensued at the dinner table. Suffice it to say, their tastebuds have not taken on adult maturity yet. Preheat the oven to 400F. Heat the olive oil in a skillet over medium heat and, when it shimmers, add the garlic. Cook the garlic until fragrant and golden, about 3 minutes, and add the spinach. (Don't worry about a little water clinging to the leaves; it will help steam the greens.) Reduce the heat to medium, add a pinch of salt and a few turns of freshly ground black pepper, and cook, stirring occasionally, until the spinach is just wilted, about 3 minutes more. Transfer the spinach to a bowl to cool (it need not cool completely before you proceed, but you don't want it so hot it will start cooking the eggs before they get in the oven). Toast the bread slices in a toaster and butter them as they are done. Lightly butter four ramekins or a baking dish large enough to hold the brioche in one layer (I used a 9x13-inch pan). Arrange the brioche on the bottom of the dish(es) and evenly scatter the wilted spinach over the bread, making rough little nests to hold the eggs in place. Crack the eggs into the spinach nests and season them with salt and pepper. Drizzle creme fraiche over the dish(es), sprinkle with grated Parmesan, and set on the lowest shelf of the oven. Cook until the whites are just set but the yolks are still runny, about 12-15 minutes. (I baked mine until both whites and yolks were set.) Serve immediately. To make gluten-free: substitute gluten-free bread for the brioche. 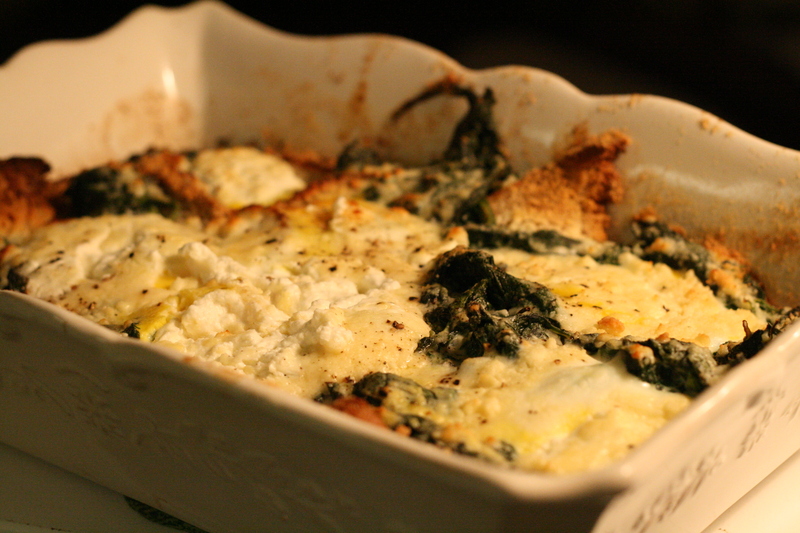 And, check back Wednesday for our March Magazine Review and another great dinner recipe using spinach. This looks delectable! I am definitely going to try this one! Thanks for posting it - Spinach is a favorite around our house, so I will stay tuned in for what's coming up next!